I swore I wasn't going to do it. I had done it before and in all but a few instances, it had turned out to be a major disappointment. I just wasn't going to set myself up for more of the same. But then curiosity got the better of me and I figured what the heck? I can endure anything for a couple hours and, who knows, it just may turn out to be enjoyable. That kind of reasoning is what had me settling into a Senior discounted, matinee priced seat (because why pay full price when you can get the double discounted, Saturday afternoon, old folks fare?) 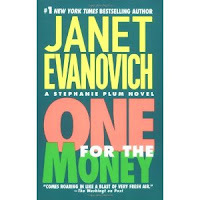 at my local movie theater as I waited for the opening credits of One For the Money, the new movie based on the first book in the popular Stephanie Plum series by Janet Evanovich. You should know that I love this series and have solid images of the cast of characters in my mind's eye so I approached the film with more than a bit of trepidation. Would the script stick to the storyline of the book? Would the actors match, or at least come close, to how I'd envisioned them? Would I laugh as I had while reading the book? Surprisingly, I enjoyed the movie more than I had anticipated. No, all the actors did not match my idea of how the characters should look though a few - Lula and Grandma Mazur - were darn close and yes, the movie moved excruciatingly slow in some places but it followed the book closely and, overall, I enjoyed it more than I thought I would. And that got me to thinking about other books I'd like to see on the big screen. 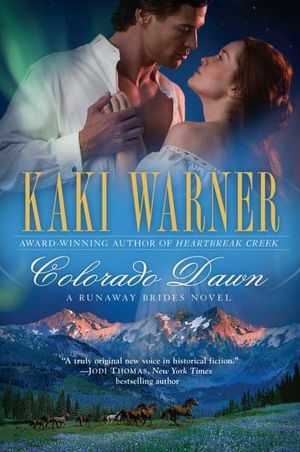 Kaki Warner's new Runaway Brides series is set on the Colorado frontier, against the backdrop of the rugged and beautiful Rocky Mountains. I've been enthralled by Westerns since I was a kid and Warner's are tailor made to fulfill my love of romance combined with plenty of action, humor, danger and emotion in stories centered around smart women and the rugged men (including a Highlander!) who win their hearts. Shoot, for her stories, I'd even be willing to fork over the full price of a ticket! Christina Dodd's new Bella Terra Deception romantic suspense series is perfect for the big screen. 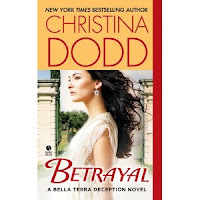 Set in the verdant California wine country, this series brings us the stories of three emotionally tormented brothers (who happen to be of Italian descent and gorgeous with a capital G) who join forces when their beloved grandmother is attacked in her home. What follows are three sizzling, action packed stories that gradually unveil long-held family secrets, vendettas, priceless jewels, murder and a missing bottle of wine that combine to threaten not only the new-found happiness they've found but their very lives. Yep, I can totally see this on the big screen! 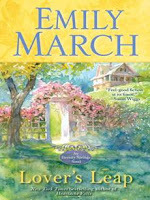 We go back to the Colorado Rockies for Emily March's Eternity Springs series; contemporary small-town stories that break your heart then put it back together again stronger than before. With a beautiful setting, a strong core of friendship among the female protagonists and deeply emotional tales of love, loss, hope and second chances, these are books that would translate beautifully to the big screen. And I've already cast one role; Betty White would make a perfect Celeste, our motorcycle riding angel! Okay, so there are a few of the books I've been reading that I'd like to see turned into a movie. Now it's your turn! Do you enjoy watching movies that have been adapted from books you've loved? Do you find yourself seeking out the books you haven't read after seeing the movie? What books would you like to see on the big screen? Any thoughts as to who you'd cast as the characters? The Warner series WOULD be good for a movie series. I think I would really like to see the JR Ward series in movie form...but just like you said, it's awfully hard to live up to how awesome the books are. Hi PJ, I'm so glad to hear that you enjoyed the movie. George and I are planning to see it this weekend and I still had mixed feelings about it. I have to agree with the brunette librarian about the declining quality of this series. I used to so look forward to a new Stephanie Plum but they just don't have the same spirit, quality of writing, or originality they once had. They have become formulaic and it's not a good formula. As to your question, there are so many books I would love to see filmed. Even though I have not read it yet, I have a feeling that Eloisa James' PARIS IN LOVE would make a great film. I'm usually disappointed in movies made from books I love, so I don't torment myself by going. Having said that, bring on THE HOBBIT. Flora, I still have mixed feelings about the movie as it relates to the books. I didn't run from the theater shouting, "What a terrific movie!" but neither did I spend the rest of the weekend complaining about it. It was enjoyable, not great, but a pleasant way to spend an afternoon. I agree with you on PARIS IN LOVE! Marybelle, I'm with you on THE HOBBIT! Deerdoe69 said, I havebn't seen ONE FOR THE MONEY yet but always thought Sandra Bullock would have been a good Stephanie. Oh, me too! She was the actress I immediately thought of while reading the books. I was not pleased when I heard that Katherine Heigl had been cast but she surprised me. I think Kaki Warner's books would be great as movies, and I love Flora's suggestion of April in Love. Now I'm thinking about the casting of that one. Janga said, To Kill a Mockingbird is a rare example of a movie that I thought did justice to the book. A very good example of how to do it right, Janga. Great post PJ! Thanks for sharing your thoughts on One for the Money with us. I know a lot of folks, JE fans in particular, were afraid of the movie not doing the book justice. I have watched a number of Nora Roberts movie that were made into Lifetime movies. Some were more successful than others, but I really enjoyed the adaptations of Carolina Moon, Montana Sky, Blue Smoke, and High Noon, all of which I thought followed the book reasonably well. I would love to see more of her books made into movies, and I think JQ's To Catch and Heiress and How to Marry a Marquis would be wonderful too. I'd suggest her Bridgerton series, but that could get a bit unweildy, lol. I've never read the Stephanie Plum books, but would like to see the movie, PJ. More than likely, I'll wait until DVD. As for movies that have turned out good, I agree with Janga about To Kill a Mockingbird. I also liked what they did with the Harry Potter books (which you probably knew I'd say *g*). They captured the essence of the books even though they had to leave a lot of stuff out. I agree with you, PJ, about loving THE HUNT FOR RED OCTOBER, but not really PATRIOT GAMES. That's why I often have a problem with books being translated to movie format. HARRY POTTER was pretty good, all in all, although there were several things they left out. But I really enjoyed them and own them all. I'd love to see Christina's Darkness Chosen on the big screen or on television. That would be fun! I've finally gotten around to reading the Stephanie Plum series - I'm on #12. I do enjoy them, but it is getting a bit annoying that she can't settle with Morelli(who's got my vote) or Ranger. I will see the movie eventually, and as I read I envision the main actors as the characters. I like your choices. I'd pay full price to see any of those pictures. I would have thought the Janet Evanovitch books would have been well suited for a TV series. There are enough of them to get a season well on its way. I liked One for the Money, I went with several ladies from work and it was great. We had passed the books around the office and in honor of the movie we started a major re-read so it would be fresh in our minds. I think they did a pretty good job on matching the characters but Ranger didn't quite fit my image and though Grandma Mazur was close, Debbie Reynolds was a lot prettier than I had her in my mind's eye. The continuing series is starting to get a sameness to it, I am not at the store the day of release for a new one. I wait until they are in paperback before I get the next in the series. I think the Harry Potter movies were a very good match for the books considering they have to leave out so many details by necessity when making books into movies. I don't think they could find enough huge, gorgeous men to make the Black Dagger Brotherhood into movies and though I enjoy the books to the max I think they would be a bit too much in living color on screen. Yes, I am a wimp, too much blood and gore and I am out of there. Lord of the Rings was a masterpiece in my opinion but I think LOTR and HP are the exceptions rather than the rule. I personally can think of at least 3 historical series I would like to see as movies but don't believe the movie makers could carry it off. The Bridgerton's-Julia Quinn, The Effington's-Victoria Alexander, and Mary Balogh's Bedwyn family would all be great. As far as matching the characters to actors and actresses I don't have a clue. I never was good at that. Like a lot of others here I think Sandra Bullock would have made a great Stephanie and that was the first person I thought of when I heard about the movie. Lisa said, Thanks for sharing your thoughts on One for the Money with us. I know a lot of folks, JE fans in particular, were afraid of the movie not doing the book justice. You know, I love Nora's books but I've never watched one of her Lifetime movies. Andrea said, I also liked what they did with the Harry Potter books (which you probably knew I'd say *g*). I could see a few (or all) of Julie James's books turned into movies. I think they would be terrific. I'd love to see Julie's books on screen! Gannon said, I'd love to see Christina's Darkness Chosen on the big screen or on television. That would be fun! 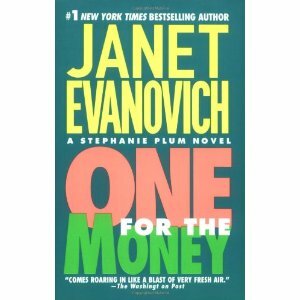 Di said, I've finally gotten around to reading the Stephanie Plum series - I'm on #12. I do enjoy them, but it is getting a bit annoying that she can't settle with Morelli(who's got my vote) or Ranger. Librarypat said, I would have thought the Janet Evanovitch books would have been well suited for a TV series. There are enough of them to get a season well on its way. I agree! Not only would we get more stories but we'd be able to watch relationships grow and change as they do in the books and we'd see more of secondary characters. I didn't get nearly enough of Grandma Mazur and Lula in the movie! Dianna said, I think they did a pretty good job on matching the characters but Ranger didn't quite fit my image and though Grandma Mazur was close, Debbie Reynolds was a lot prettier than I had her in my mind's eye. Dianna, I thought Debbie Reynolds did a good job but I had always pictured Cloris Leachman in my mind while reading the books. There were several groups of women in the theater the day my girlfriend and I went to the movie. From the pre-film chatter it was clear most of them had read the books and based on the laughter during the movie, I'd say most of them enjoyed the film. Dianna said, I personally can think of at least 3 historical series I would like to see as movies but don't believe the movie makers could carry it off. The Bridgerton's-Julia Quinn, The Effington's-Victoria Alexander, and Mary Balogh's Bedwyn family would all be great. I'd love to see all three but I agree that movie makers would have a tough time doing the books justice. Masterpiece Theater would be the best bet in my opinion but I can't see anybody else pulling it off. I came back to read the comments that came in after my post the other day. Also, I have to say that one movie sticks out in my mind that is the exception to the rule of book being better than it's film version. "Forrest Gump" is a tiny poorly written little book that was given heart, soul, humor and humanity when it was turned into a film. Flora, I'm not sure how I missed that piece of information but I never realized that "Forrest Gump" had been based on a book. You're right about the movie though. It was definitely filled with heart, soul, humor and humanity! Usually disappointed with books into movies, but it would be great to see Shanna made into a film. No specific actors in mind.